Heating and cooling accounts for about 50 percent of your energy usage, but the average house has enough leaks and drafts to equal a 1 sq. ft. hole. 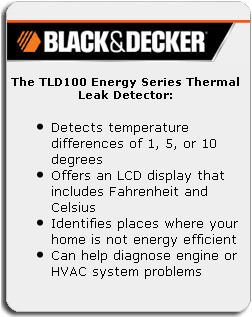 Cut down on wasteful spending with the help of the Thermal Leak Detector from Black and Decker .The TLD100 is an infrared sensor that finds these leaks along walls, molding, ductwork and more. Auto color change provides quick, intuitive feedback, showing users where to caulk, insulate, etc. The Black & Decker thermal leak detector helps you increase the efficiency of your home’s insulation by finding leaky areas that can lead to higher heating and cooling bills. 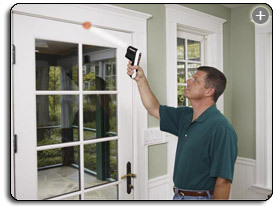 You’ll instantly identify problem areas around drafty windows and doors, and uncover hidden leaks and insulation “soft spots” around your home. 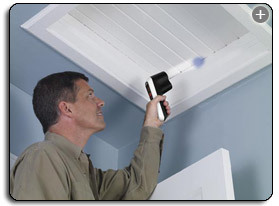 Check windows, ducts, and walls with the thermal reference light that indicates hot and cold spots. You can even use the detector to diagnose engine misfires or check your refrigerator and freezer settings. The TLD100 lets you identify weak spots that can lead to high energy bills. View larger. The thermal leak detector makes it easy to monitor your home’s energy efficiency by finding areas that let heat out and cold air in. Simply set the detector’s temperature tolerances to one, five, or 10 degrees and scan the light across the area you want to inspect. The light will change to red for warmer spots and blue for cooler spots to detect air leaks in both warm and cool weather. The detector also displays temperatures in either Fahrenheit or Celsius on the LCD screen. Check for drafts or leaks around your fireplace, recessed lighting, electrical outlets, along floor molding, or any place that may have improper seals, caulking, or seams that aren’t immediately visible. An included booklet gives you tips and instructions on how to seal leaks and improve insulation. Sealing the leaks and improving insulation in your home can help you save as much as 20 percent on your heating and cooling bills. An efficient, greener home will stay cooler in summer and warmer in winter, increasing its resale value. Use the thermal leak detector to check your refrigerator and freezer temperatures and efficiency. Diagnose engine problems related to overheating or coolant leaks to avoid costly repairs and mechanic bills down the road. The thermal leak detector can also check the operation of your HVAC system, so you can perform preventative maintenance as needed. 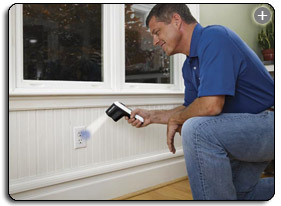 The Black & Decker thermal leak detector is covered by a two-year warranty. Sealing leaks and improving your home’s insulation can help you save as much as 20 percent on energy bills.